Oil States supplies specialty riser joints for a variety of riser applications. As part of a broader scope of supply for TLP, SPAR and FSHR production riser systems, Oil States provides tapered stress (TSJ), and keel joints, as well as connected riser joints. 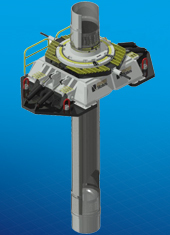 As part of complete drilling and intervention/workover riser systems, Oil States supplies tapered stress joints, telescopic joints, and connected riser joints. Specialty joints can be supplied as part of turnkey riser packages for drilling/workover and production applications. Decades of experience in inspection and repair of riser joints is now translated into high-quality durable designs to withstand the harshest metocean conditions. Custom engineered for high-fatigue applications to withstand large bending moments along with maximum tensile-load capacity. Custom designed to optimize length, wall thickness, and envelope. In combination with supply of top and bottom connection systems, Oil States minimizes project interfaces to accelerate delivery schedules and reduce customer costs. Suitable for high-pressure drilling riser or production riser applications. Tapered stress joints can be supplied in steel or titanium for various rigid-production riser applications including TLPs and SPARs, free-standing hybrid risers (FSHRs), or for jack-up mobile offshore production units (MOPUs). Keel joints are designed for SPAR applications. Tapered stress joints can also be provided for high-pressure drilling as well as completion/workover applications. Optimal wall thickness helps to minimize cross-sectional stresses in the riser. Telescopic joints can be supplied for jack-up, semi-submersible or drillship drilling riser applications to provide tension compensation. Equipped to provide specialty riser joints incorporating a variety of connector types, riser materials and welding technology.